The Army West Point football team took down Liberty 38-14 in its home opener here on Saturday afternoon. 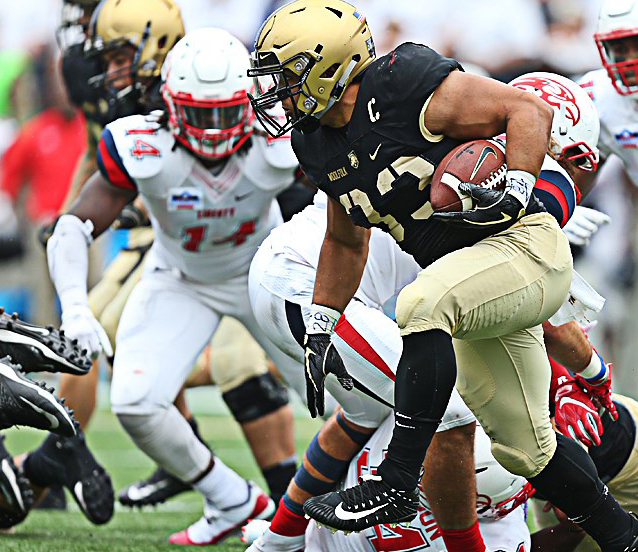 WEST POINT – The Army West Point football team took down Liberty 38-14 in its home opener here on Saturday afternoon. The Black Knights scored in every period and jumped out to a 24-0 lead before allowing their first points of the game three minutes into the second half. Senior Darnell Woolfolk led the Cadets with 98 yards rushing on 17 attempts. Fred Cooper and Calen Holt closely followed with 81 and 72 yards rushing, respectively. Christian Hayes led the receiving corps with one catch for 44 yards, followed by Kell Walker’s 17-yard pickup in the fourth quarter. Junior quarterback Kelvin Hopkins Jr. threw for 61 yards and finished 2-of-7 with a touchdown pass. The Black Knights are now undefeated at home in their last eight contests, which is the longest span since winning 14-straight from 1984-86. Army has won its last three home openers, while Monken is 4-1 during his tenure on the Banks of the Hudson in home openers. Woolfolk scored his 25th career touchdown, which shifts him into the Academy’s top-10 list. The Endwell, N.Y., native’s two touchdown performance marked the seventh time in his career he registered multiple scores. The Black Knights had 500 yards of total offense and did not commit a turnover. First the first time since 2016, Army had passing score in back-to-back games. The Cadets had five rushers with over 50 yards each for the first time since defeating Lafayette on Oct. 25, 2016. Army shutout an opponent in the first half for the first time since blanking Air Force last year on the road. Landon Salyers connected on his first-career field goal from 42-yards out. * Army struck first with a 25-yard touchdown run by Holt with 3:11 left on the first quarter clock. Fred Cooper helped the drive with an 18-yard pickup on the previous play to get the Black Knights into good field position. * After a three-and-out by Liberty and a targeting call on the punt, Army found itself back in prime scoring position. Starting from the Liberty 31, the Black Knights needed just two plays to add to their lead as Woolfolk burst his way through the gap and into the end zone for a 26-yard touchdown scamper. * Right before half, the Cadets added a 42-yard field goal to head into the locker room up 17-0. * Early in the third quarter Army made it a 24-0 ballgame when Hopkins Jr. connected with Hayes for a 44-yard touchdown pass. That score was the junior wide out’s first career points. * The visitors answered with two-straight passing touchdowns to pull within 24-14 with 5:39 remaining in the third quarter. * The Black Knights then blanked the Flames in the final period and added their fourth touchdown of the game once Woolfolk found pay dirt for the second time. The Black Knights are back in the comfy confines of Michie Stadium for their next contest against Hawai’i on Saturday.